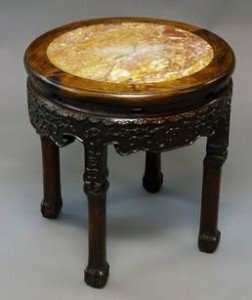 A Chinese rosewood occasional table, 19th century, with rouge marble inset circular top above carved prunus blossom frieze on four square legs to ball and claw feet. An 18ct. 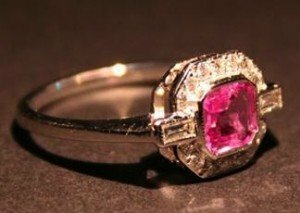 White Gold Pink Sapphire and Diamond Cluster Ring, with a central square pink sapphire surrounded by diamonds and with baguette diamond shoulders. 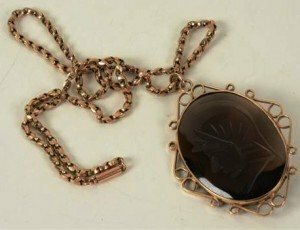 A yellow metal and smoky quartz pendant, the large round quartz etched with warrior portrait, on 9ct gold chain, chain 6.5g, 26.5cm long. 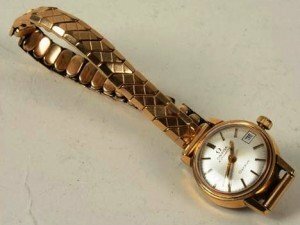 An Omega Automatic lady’s wristwatch, the silvered circular dial with gilt baton numerals and date window, on flexible rolled gold bracelet strap. 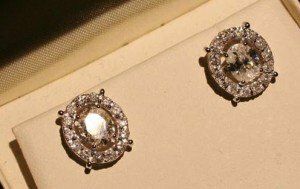 A Pair of 18ct. White Gold Screw Back Diamond Ear Studs, each with an oval central diamond surrounded by diamonds within a pierced setting. An 18ct. 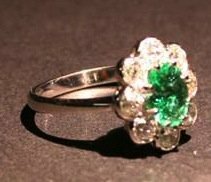 White Gold Emerald and Diamond Cluster Ring, with a central oval emerald surrounded by diamonds within a pierced setting, approximately 1.0ct/1.0ct. 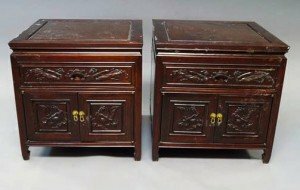 A pair of Chinese stained hardwood bedside cabinets, 20th century, of square form with single frieze drawer above pair of cupboard doors, the front carved with figures, raised on square feet. 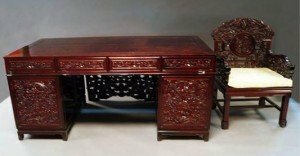 A large Chinese stained hardwood pedestal desk, 20th century, with four frieze drawers above two banks of three drawers, each panel profusely carved with dragons amidst clouds, with carved and pierced back panel, 67cm hig x 172cm wide x 87cm deep, together with a matching elbow chair. 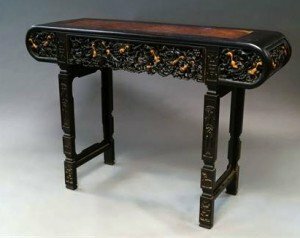 A Chinese rosewood scroll table, early 20th century, with rectangular burr wood inset top, the frieze carved and pirced with squirrels amongst fruiting vines, on square supports carved with panels of animals and auspicious motifs. 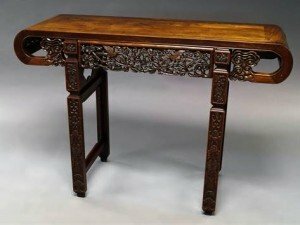 A Chinese hardwood table top cabinet, early 20th century, the hinged lid above green hardstone dragon set frieze and panel door set with carved green hardstone dragon and phoenix around a double happiness symbol on a ground of carved clouds, enclosing arrangement of ten drawers, the base carved with archaistic motif, on squat feet. A Chinese red lacquer rectangular altar table, late 19th century, painted and incised with figures in a garden landscape, with pierced floral decorated frieze. 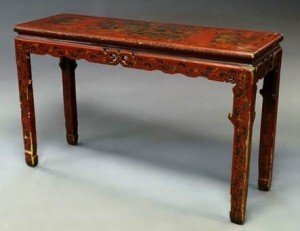 A Chinese hardwood scroll table, early 20th century, with profusely carved and pierced frieze on square blind fret carved legs. 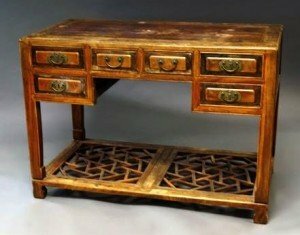 A Chinese hardwood desk, late 19th/early 20th century, with rectangular top above six frieze drawers, on square legs with boken ice fret under tier, on block feet. 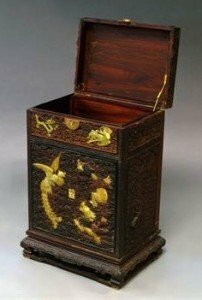 A Japanese hardwood and metal mounted chest on stand, late 19th/early 20th century, the lacquered and gilded doors opening to enclose arrangements of drawers, above a long frieze drawer on a lacquered rectangular base, 121cm high x 90cm wide x 46cm deep. 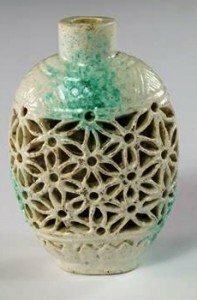 A Chinese porcelain reticulated snuff bottle, late 19th century, with cream glaze splashed with turquoise, pierced with floral motifs. 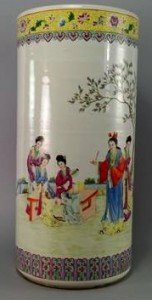 A Chinese porcelain famille rose umbrella stand, Republic period, painted with six women in a garden landscape scene beneath a lotus scroll border on a yellow ground, artist’s colophon and seal mark to reverse. 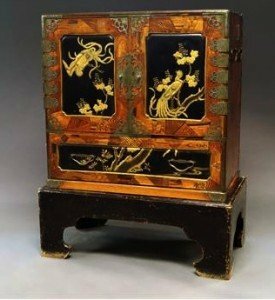 A Chinese rosewood and mother of pearl rectangular stand, early 20th century, inlaid throughout with floral sprays and archaistic motifs, with stepped apron above scroll decorated stretchered feet. A pair of Chinese red cinnabar lacquer boxes and covers, late 18th century, decorated with scenes of scholars within mountainous landscapes, the edges with shaped panels of lotus flowers and leaves, on a diaper ground. 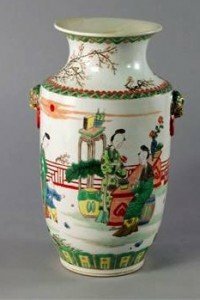 A Chinese vase, in the Kangxi style, 19th century, with lions mask handles, painted with a continuous scene of figures in a formal garden, seated at tables, with plum blossom to the neck. 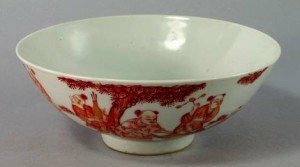 A Chinese porcelain bowl, 19th century, painted in iron oxide red and heightened with gilt with scenes of children playing in a garden.